ABOVE: A Seine dinner boat passes the Conciergerie on the Île de la Cité. The River Seine doesn't just flow through the heart of Paris--it is the heart of Paris, having supplied water, transportation, and food to the locals since Celtic fishermen of the Parisii tribe built a village on what is now the Île St-Louis more than 2,200 years ago. This means that a dinner cruise on the Seine might be viewed as a kind of historic pilgrimage, making the price of an expensive meal and boat ride easier to bear. In this article, we'll tell you about Seine dinner cruises from six Parisian companies--three on this page, and three more on page 2. The best-known purveyor of Seine dinner cruises is Bateaux-Mouches, which we discussed (with other fleets) in our Paris Sightseeing Boats article. Dinner cruises run daily year-round, with embarkation starting at 7:30 p.m., sailing at 8:30 p.m., and return to the Bateaux-Mouches pier by the Pont de l'Alma at 10:45 p.m. Two menus are available, with one priced at €99 and the other at €155. Lunch is available on weekends and holidays. The price is €55 (€29 for children), with boarding at 12:15 to 12:45 p.m. (departure at 1 p.m.) and return at 2:45 p.m.
For more information, visit the Compagnie des Bateaux-Mouches Web site. 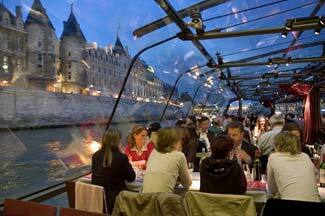 Several dinner options are available on the Bateaux Parisiens restaurant boats, with prices ranging from €69 to €215. Lunch is cheaper, starting at €59 and progressing up to €89 for a seat in the bow. For details, including departure times, visit the Bateaux Parisiens Web site. This company has two-hour dinner cruises at 9:15 p.m., with boarding 30 minutes before departure. Adults pay €90; children are charged €35. One-hour "snacking cruises" are also available. To check the menus or book a voyage, see the Vedettes de Paris Web site. Photo: Copyright © Paris Tourist Office. Photographer: Catherine Balet.